Each Cleanis Care Bag disposable urinal comes with a GelMax absorbent pad that quickly absorbs up to 16 oz. of liquids. All liquid collected is converted to a gel. All liquid collected is converted to a gel - no spilling. And, no odor! Cleanup is easy as tying the bag closed and disposing in the trash. Comes in a zippered bag of 20 disposable urinals with a built in tie closure. Each urinal bag is 5.25"" x 12""
TravelJohn Disposable Urinal’s are by far the best solution for eliminating frequent stops while traveling. The UriBag® F is more convenient than adapted toilets and is available whenever needed. 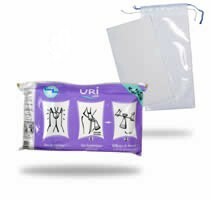 The Male UriBag® is exactly what every male need and the best alternative to public facilities!